Murray Costello's impact on hockey extends to U.S.
Murray Costello may be the head of Hockey Canada, but he's also had a major impact on the growth of the sport in the United States. That impact will be recognized on Oct. 15, when he will be honored with the Wayne Gretzky International Award during the U.S. Hockey Hall of Fame induction ceremony at the Plaza of the Americas in Dallas. After playing in the NHL for three Original Six teams in the late 1950s, Costello eventually embarked on a more fulfilling career path that would ultimately provide Hockey Canada with the impetus needed to a prosperous future. Costello's hard work and negotiating acumen played a significant role in the Canadian Hockey Association and the formerly independent Hockey Canada organization joining forces to form an all-new organization under the name of Hockey Canada in 1994. "I guess I lucked out enough being kind of the right guy in the right spot at the right time," Costello told NHL.com. "Getting the programs together in an orderly way to form what we call the 'Program of Excellence,' which led to our National Junior Team. "That kind of changed the whole atmosphere of having good experiences for our kids coming through the development system, so that after getting those experiences winning a gold medal for Canada at the junior level and then moving on to the NHL, they were much more in tune to come back and play for us when we asked them." After the merger, Canada won four of the next five gold medals at the World Junior Championship with Costello at the forefront. "The whole system took on a much more positive flavor and I think that was having a role in making that happen and working with people who were awfully good to work with," Costello said. His contributions wouldn't stop there either. Costello oversaw the formation of the Canadian women's team and, in turn, the rapid development of the sport that paved the way for the debut of women's hockey at the 1998 Winter Olympics. On top of that, Costello has been an extremely positive influence on hockey in the United States, helping USA Hockey and Hockey Canada collaborate on coaching education projects in the late 1970s. The basis for the U.S.-Canada junior transfer agreement also dates back to Costello's cooperation with USA Hockey executives. "During his time with the IIHF and Hockey Canada, he has been incredibly forthcoming with the spread of knowledge and ideas that can positively impact American administrators, coaches and players of all ages," said Ron DeGregorio, president of USA Hockey. It's for that reason Costello, former vice president of the IIHF, will be honored with the Wayne Gretzky International Award during the U.S. Hockey Hall of Fame induction ceremony at the Plaza of the Americas in Dallas on Oct. 15. The award, established by the U.S. Hockey Hall of Fame in 1999, pays tribute to international individuals who have made major contributions to the growth and advancement of hockey in the United States. Past recipients of the award include Anatoli Tarasov (2008), Herb Brooks (2004), Bobby Hull (2003), Scotty Bowman (2002), Scotty Morrison (2001), the Howe family (2000) and Gretzky (1999). "I was more than a little surprised because it's not often you get recognized by a nation other than your own and, for a Canadian, any award with the name Gretzky attached to it makes it that much more special," Costello said. Growing up in South Porcupine, Costello and his three brothers quickly realized that hockey was their ticket out of the small, gold-mining community situated in northern Ontario. "There wasn't much opportunity [in South Porcupine] other than the mines," Costello said. "And there wasn't a whole lot of money being made at the mines, so to pay for a college education, the name of the game was getting offers by playing hockey." Costello would do just that, playing for St. Michael's College School, whose junior hockey team was sponsored by the Toronto Maple Leafs. After playing three seasons with the St. Mike's Majors from 1950-51 through 1952-53, Costello debuted with the Chicago Blackhawks during the 1953-54 campaign. He'd also play for the Boston Bruins and Detroit Red Wings before earning a law degree and becoming an executive with the Seattle Totems of the Western Hockey League, leading the club to consecutive championships in 1967 and '68. "I had absolutely great memories in the NHL," said Costello, who had 13 goals and 32 points in 163 career games. "It was a very special time in the sense you still traveled by train. It was the old six-team League, and the players and teams were close because we played each other so often. Just having the privilege of playing with and against players, like the 'Rocket' [Maurice Richard] and Jean Beliveau in Montreal and Gordie Howe and Ted Lindsay in Detroit and Fernie Flaman and Leo Labine in Boston, were great times." But Costello never had an interest in what he called "the old way of player thinking." "I always felt we really had to concentrate on playing the game at the highest skill level with a whole lot of discipline because we lost so many games because of penalties," he said. "I don't think I ever bought into that intimidation factor, and that was part of the reason the NHL didn't have the appeal for me that it had for most. I think I had the skill level to play, but I didn't find it very interesting. "I've always felt that if you have players who can dance, you have to let them dance, and I think we have many examples of that," Costello continued. "It still is pleasing to me that [Hockey Canada] can produce players that can match the skills of any players anywhere in the world." 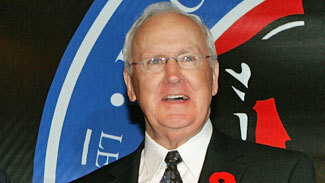 Costello became president of the Canadian Amateur Hockey Association, now known as Hockey Canada, in 1979. Costello is equally proud of his role in the growth of women's hockey. "I guess something that still surprises me, and I hope it doesn't sound too chauvinistic, but I never believed in my mind that women would train the way men do, but in fact, they actually train even harder," Costello said. "The two national teams in North America play the game at a great skill level and love doing it just as much as the men."